A trickle from the rocks at Mile 109 draws people who like its taste and like the fact that it's not treated city tap water. But is it safe? 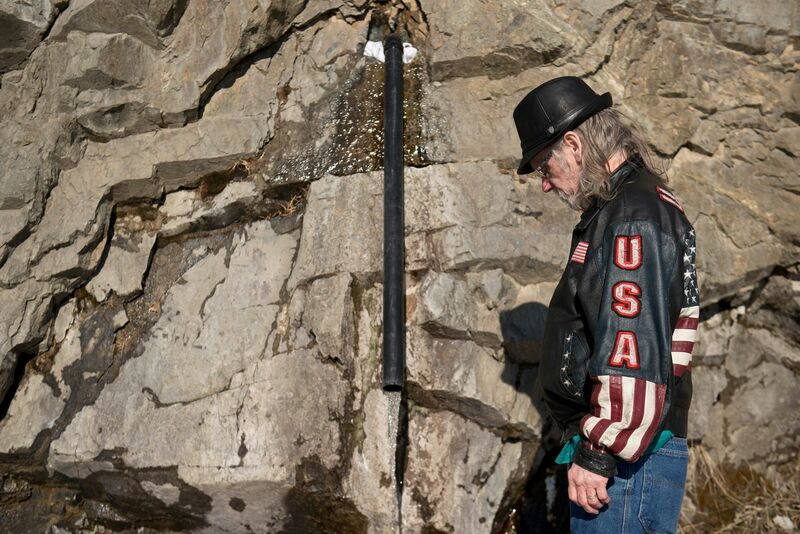 A 3-inch hole in a rock wall at Mile 109 of the Seward Highway quenches many thirsts. Tourists pull over for a cup of refreshing liquid Alaska, wild and cold. Locals, suspicious of treated city water, make the drive regularly to resupply their homes, even though there's less known about this source of water than the water from their sinks. 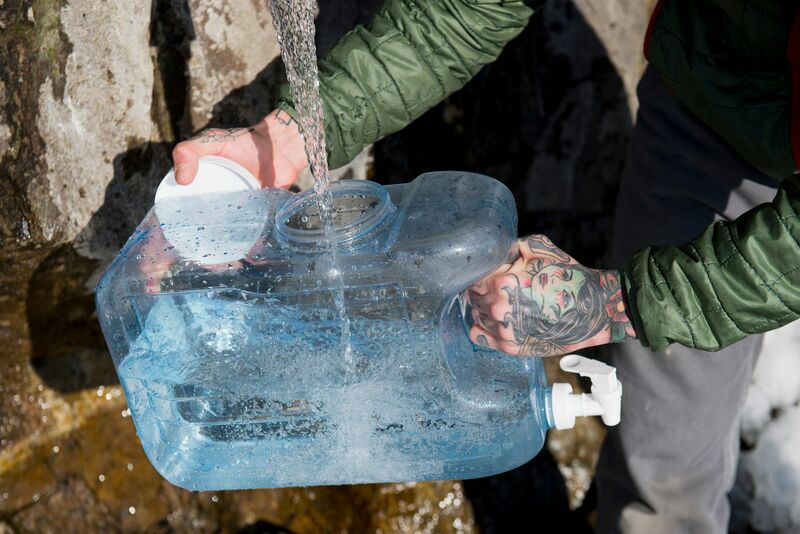 Others simply prefer the taste of the water that trickles there, supplemental hydration they take away one Nalgene bottle at a time. This drainage hole in the rock between Beluga Point and Windy Corner on Turnagain Arm draws visitors all day long. Anyone who has driven the highway with any regularity has seen them, perhaps wondered why, and maybe had to brake for them as they dart across the road. One March afternoon, Ian Choi popped his trunk to grab a sleeve of Styrofoam cups for his passengers. Choi gives tours in Alaska, often to Korean visitors. People in Anchorage love this water, he told them. Three women climbed out of his car and crossed the highway and took a sip. "Need a cup?" Choi offered to a stranger who also had pulled over. Mica Sexton pulled up next. He said he has lived in 14 communities in Alaska since he first came here in 1997. Before that, he had been living out of a backpack and traveling the world. Sexton filled six large jugs for himself and his 180-pound Irish wolfhound to consume back home. Together, they go through about a gallon a day, he said. People are too trusting of the government and media, he said. Fluoride is one reason, he said, that he "won't touch" tap water. "I think most people, when you tell them that somebody that they trust to look out for their good is putting something bad in their water, most people just look at you and tell you you need a tinfoil hat," Sexton said. Sexton said he also suspects city water treatment removes healthy minerals he believes he's getting from this large drinking straw poked into the Chugach Mountains. "Last time I drank tap water was, I don't know, eight years ago, so I don't know what the tap water tastes like," he said. "But from what I'm told, this tastes a lot better." Maurice Mitchell was next in line. Like Sexton, he carries a length of pipe in his vehicle to insert in the rock, just in case the makeshift tap turns up missing. It often does, they said. The pipe has been removed and replaced many times over the years. Mitchell lined jugs in the bed of his pickup neatly as classic rock spilled from the cab. He collected about 50 gallons, a 10-day supply for his three-person household in Anchorage. He parked on the mountain side of the road, angled on the embankment just feet from the traffic lane in a 55-mph zone. It seemed safer than crossing the road several times, he said. "We use this for everything. For plants, household water, cooking, everything," he said. Mitchell believes the water is cleaner and healthier than what comes out of the tap. "I haven't had it tested myself, but I've talked to a few people that have come out here and had it tested," he said. Several others filed through in a steady procession that afternoon, filling containers in myriad shapes and sizes. A car swerved into the pullout from the northbound lane, crossing the southbound lane while traffic was in clear view. Another man posed for a picture while taking a sip, his friend capturing the moment with a phone in one hand and a cigarette in the other. 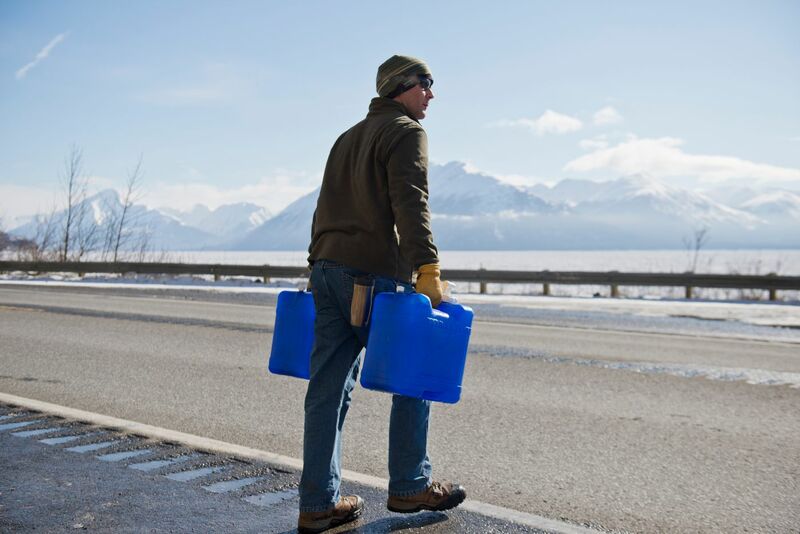 Later, an older man strained to carry his jugs, then paused with his companion to watch the ice drift by in Turnagain Arm. And in the rare quiet moments, two sounds could be heard — the thin stream of the water splashing on the stones below, and the sound of pebbles and rocks occasionally dropping from the cliffs above onto the pavement and into the ditch. The water pipe is located within Chugach State Park, like much of the mountainous landscape along Turnagain Arm, and superintendent Tom Harrison said he gets occasional questions. But the pipe is in the Department of Transportation right of way, he said. "We don't do anything related it to it. We certainly don't sample it and test it like we do our wells in the campground kind of a thing," Harrison said. Harrison chalks up its popularity to folklore, and said he has no reason to believe it's different from water cascading from the hills at any other point along the scenic highway. "I'm not a hydrologist, but that's just draining the water that kind of filters through cracks in the rock." Similarly, DOT claims no ownership of the pipe. "Our maintenance section does not maintain this. We don't put pipes in it, and in the past they have removed some of the pipes or hardware," said Scott Thomas, an Anchorage-based DOT traffic engineer. "Basically, it's popular enough that something always appears." For DOT, the Mile 109 pipe is a concern. The highway along Turnagain Arm is the focus of ongoing safety improvements through education, law enforcement and redesign. The water pipe is a place where cars often park hazardously and pedestrians have inadequate separation from vehicles. But it's hardly the only spot. Hikers, Dall sheep watchers, ice climbers, hooligan dipnetters, water collectors — they're all user groups that can lead to unsafe parking situations on a busy highway, Thomas said. "That's really the dilemma we face, is that the Seward Highway is a recreational corridor, a scenic corridor. And when it comes down to safety issues, do we pick and choose the uses that people have?" Thomas said. 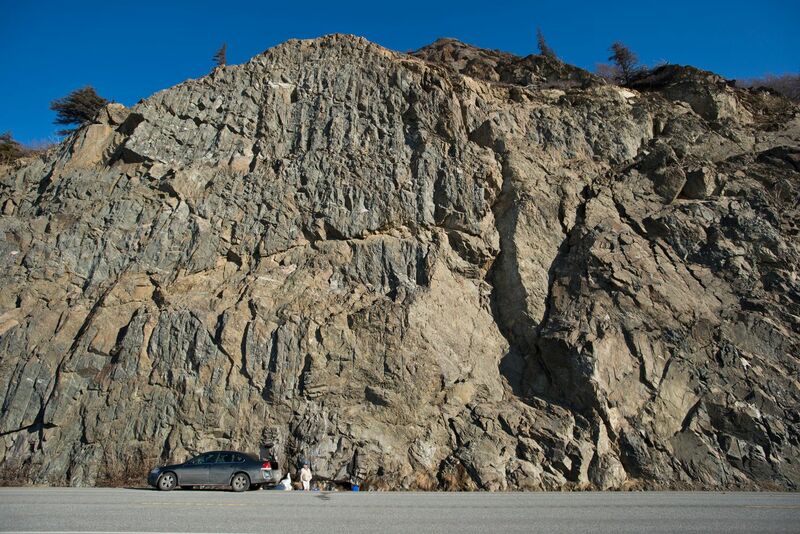 "Generally, what we've tried to do, I think when you look down the Seward Highway, is have pullouts for people." While there is a pullout across the highway from the pipe, Thomas said that stretch of road was not built to modern standards, which would call for the road to be built further from the rock face. It's just a few steps now. Last year, DOT took comments from Girdwood 2020, a community group formed to provide comment on development in the resort town, Thomas said. 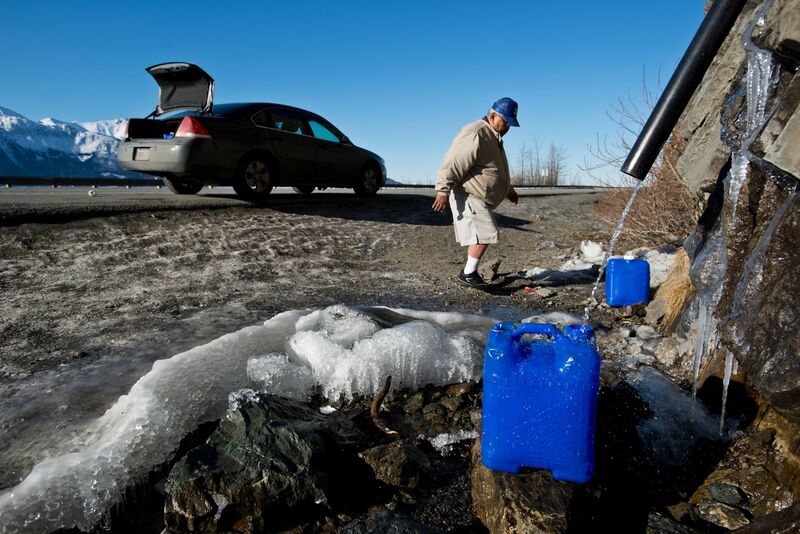 Residents who drive the Seward Highway between Girdwood and Anchorage regularly pinpointed the water pipe at Mile 109 as a particularly hazardous spot because pedestrians venture close to the highway. Those comments raised the profile of the water pipe as a problem in need of a solution to DOT, Thomas said. 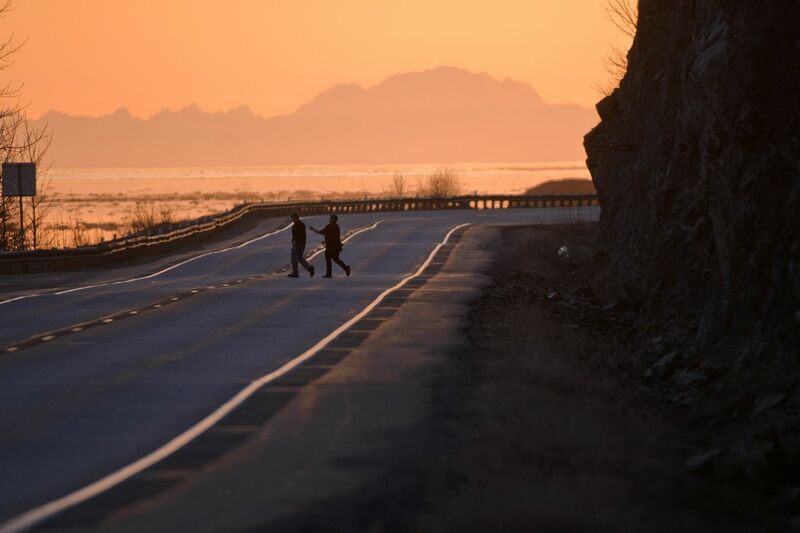 On April 14, Thomas and a representative from Alaska State Troopers drove along Turnagain Arm to make observations as part of its annual review of safety concerns. "We are intending to do something, make changes," Thomas said. "We are exploring options." 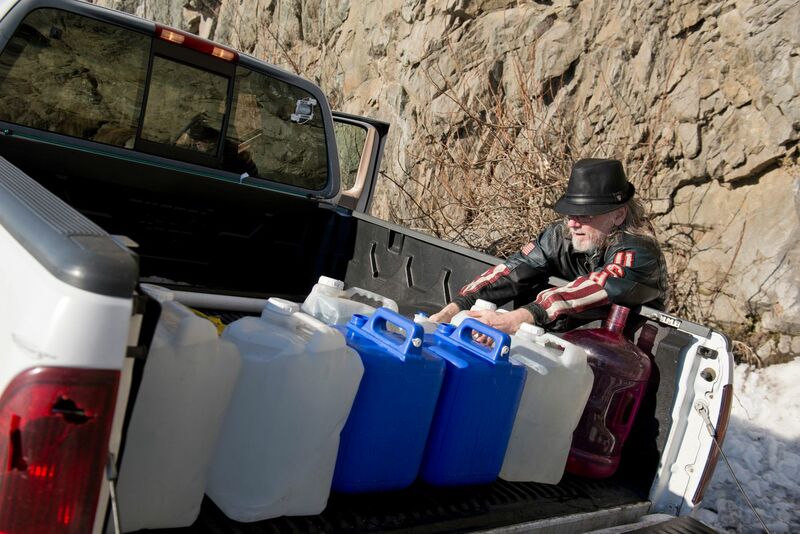 As winter continued into spring a few weeks ago, Tom Parmer worked to fill 15 6-gallon jugs and load them into his camper for himself and his brother. He says he's careful not to run out of water at home, a backup plan that is essential disaster preparedness, whether for an earthquake or the collapse of the dollar. "I'd have water at home, no matter what, unless you're insane," Parmer said. As a regular user, Parmer said the biggest safety concern at the pipe is when people park on the mountain side of the highway, instead of in the pullout where he was. "I keep bitching about that when people show up. I said, 'Get your arse over here, man. You're going to screw it all up.' "
But for Craig Boeckman, a DOT geologist who has analyzed the site, the danger isn't only coming from the north and south, but potentially from above. Boeckman said photographs indicate that stretch of road was improved, and a parking turnout constructed, in the early 1980s. Geology reports from that project recorded plans to drill 30-foot-deep drainage holes in the rock to alleviate pressure and reduce rockfall. "I don't think that people were stopping there to get water before that," Boeckman said. Several holes were drilled at the time and are plainly visible today. Three others are just above and to the left of the piped hole. Water runs from them also, though not as consistently. While some users said they believe the water comes up from the ground below, Boeckman said that's not the case. He pointed to a long vertical crack in the face of the rock. Water feeds the joints and fractures from somewhere uphill, he said, and it's very likely a 30-foot hole would intercept it. "I don't think it's a spring, where the water's coming up from below. I think the water's coming down from above," Boeckman said. But it's not the falling water that concerns Boeckman the most. It's falling rocks. For the last few years, DOT has kept an internal database of rockfall trouble spots along state-maintained highways. Mile 109 of the Seward Highway ranks in the top 10, and is the highest-ranked spot along Turnagain Arm. 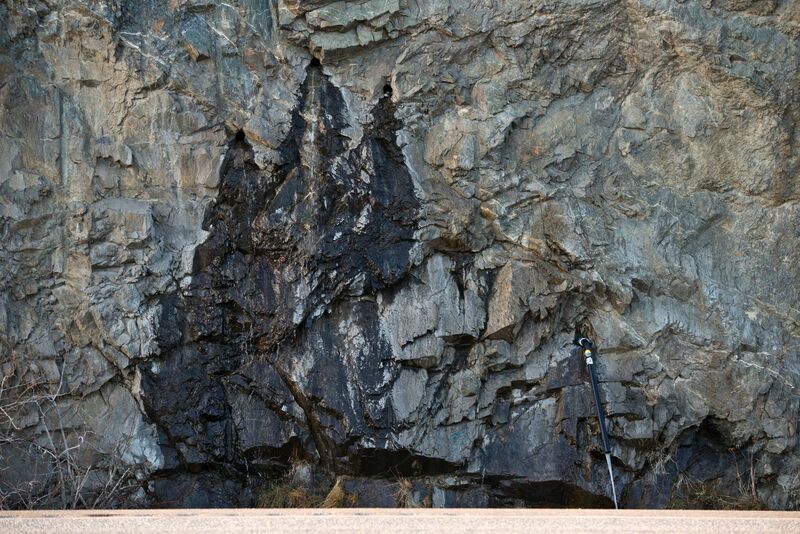 Boeckman, who evaluates rockfall hazards for traffic engineers, keeps pictures of the site. One shows large rocks in a narrow ditch next to the highway. Another shows long, black skid marks in the northbound lane. Though he knew of no injuries that resulted from falling rocks there, he said a rock as big as a vehicle fell a couple hundred feet away in 2012. Any redesign, when it comes, could affect the water source, he said. "At Mile 109, any improvements to that slope is going to change the configuration of the ditch and would ultimately change those drain holes and the access to them," he said. DOT spokeswoman Shannon McCarthy said the department is considering changes to the design of the highway at Mile 109 to address safety concerns, but no plans have been finalized. As an unsanctioned water source, the quality is not regularly monitored by DOT or Chugach State Park. On March 24, Alaska Dispatch News collected a sample and delivered it to ARS Aleut Analytical, a company that tests public and private wells for water contamination. The company provided an analysis of the water for arsenic, manganese, calcium, iron, magnesium, E. Coli and other coliform bacteria, nitrates, acidity and alkalinity, corrosivity and fluoride. In short, all categories fell within the maximum contaminant limits set for drinking water by Alaska's Department of Environmental Conservation. At least they did that day. ARS Aleut Analytical lab manager Ian Schacht said that a water quality test is just a snapshot of one point in time, which can't replace regular monitoring. Results could fluctuate for many reasons. But Schacht said the results were noteworthy in a couple of ways. "One of the more interesting things that we saw (is) that there was a hit for arsenic," Schacht said. While the level in the highway water, 3.2 parts per billion, falls below the DEC's limit of 10, Schacht notes that it's greater than what is reported for Anchorage city water sources on the state's Drinking Water Watch website. Anchorage Water and Wastewater Utility, which gets its water from Eklutna Lake, the Ship Creek watershed and some wells, said that on average, arsenic was not detected in its 2016 water quality report. Its highest reading was 0.7 parts per billion. "It's something that is not of immediate concern right now, because it is under that 10," Schacht said of the highway water pipe sample. "But it is detectable. It is there." The lab report noted that the human body was slow to rid itself of arsenic, so it is considered a poison that can accumulate in a person. The results also indicated presence of some nitrates, possibly the result of decaying plant matter. Though it, too, was measured in levels deemed acceptable for drinking water by the DEC, Schacht said nitrate and arsenic concentrations would be areas he'd pay special attention to if the water were regularly monitored. Schacht also noted that levels of calcium and magnesium indicate hard water. That's unlikely to be a health concern, but it could account for the unique taste of the water that many users described at the pipe. Schacht said hard water can taste "minerally" and leave a residue when it evaporates. Whichever tastes are present or absent from the water at Mile 109, it's one that keeps some people coming back again and again, year after year. On a clear mid-April day, thirsty Anchorage residents pooled at the pullout until the sun set after 9 p.m., a chore with a pretty nice view. Only a little ice disturbed the reflection of glowing peaks in the flat, calm water of Turnagain Arm. Paypay Oloi and Amelia Reed come here nearly every day, they said. Oloi sometimes buys water and drinks from the tap at home, but said none of it compares to what he brings backs from the highway pipe. 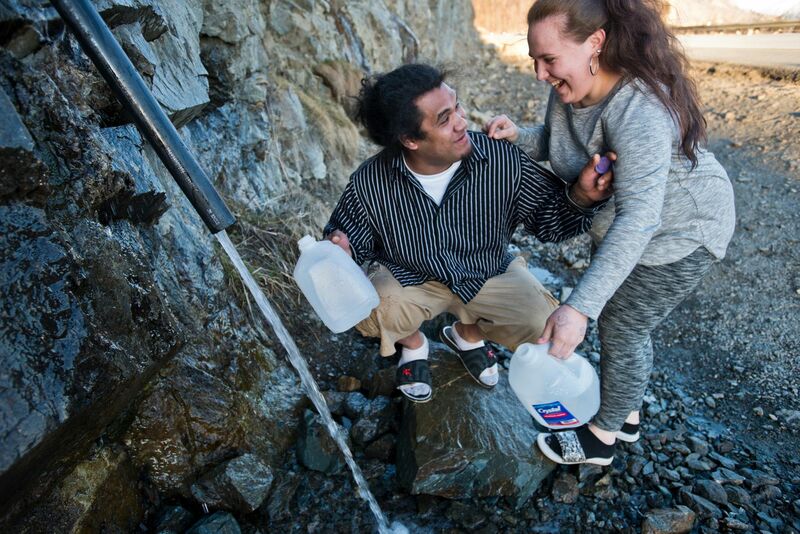 The young married couple huddled in close, each filling a 1-gallon jug as water splashed on their socks and sandals, enthusiastic about the option the Chugach rock was giving them. "This is so much fresher," Reed said. "Like it's from Mother Earth."